Buddhism in Japan has been practiced since its official introduction in 552 CE according to the Nihon Shoki from Baekje, Korea, by Buddhist monks. Buddhism has had a major influence on the development of Japanese society and remains an influential aspect of the culture to this day. 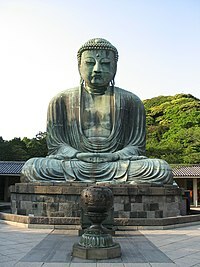 In modern times, Japan's popular schools of Buddhism are Pure Land Buddhism, Nichiren Buddhism, Shingon Buddhism and Zen. As of 2008, approximately 34% of the Japanese identify as Buddhists and the number has been growing since the 1980s, in terms of membership in organized religion. However, in terms of practice, 75% practice some form of Buddhism (compared with 90% practicing Shinto, thus most Japanese practice both religions to some extent (Shinbutsu-shūgō)). About 60% of the Japanese have a Butsudan (Buddhist shrine) in their homes. The arrival of Buddhism in China is ultimately a consequence of the first contacts between China and Central Asia, where Buddhism had spread from the Indian subcontinent. These contacts occurred with the opening of the Silk Road in the 2nd century BCE, following the travels of Zhang Qian between 138 and 126 BCE. These contacts culminated with the official introduction of Buddhism in China in 67 CE. Historians generally agree that by the middle of the 1st century, the religion had penetrated to areas north of the Huai River in China. Fusang is located to the east of China, 20,000 li (1,500 kilometers) east of the state of Da Han [大漢, "China"] (itself east of the state of Wa in modern Kansai region, Japan). (...) In former times, the people of Fusang knew nothing of the Buddhist religion, but in the second year of Da Ming of the Song Dynasty (467), five monks from Kipin [Kabul region of Gandhara] travelled by ship to Fusang. They propagated Buddhist doctrine, circulated scriptures and drawings, and advised the people to relinquish worldly attachments. As a result the customs of Fusang changed. Although there are records of Buddhist monks from China coming to Japan before the Asuka Period, the "official" introduction of Buddhism to Japan is dated to 552 in Nihon Shoki when King Seong of Baekje (聖明王, now western Korea) sent a mission to the Emperor Kinmei that included Buddhist monks or nuns together with an image of Buddha and a number of sutras to introduce Buddhism. The powerful Soga clan played a key role in the early spread of Buddhism in the country. Initial uptake of the new faith was slow, and Buddhism only started to spread some years later when Empress Suiko openly encouraged the acceptance of Buddhism among all Japanese people. According to legend, in Japan in 552, there was an attempt to destroy a tooth relic, one of the first of Buddha’s to arrive in the country; it was hit by a hammer into an anvil; the hammer and anvil were destroyed but the tooth was not. On January 15, 593, Soga no Umako ordered relics of Buddha deposited inside the foundation stone under the pillar of a pagoda at Asuka-dera. In 607, in order to obtain copies of sutras, an imperial envoy was dispatched to Sui China. As time progressed and the number of Buddhist clergy increased, the offices of Sōjō (archbishop) and Sōzu (bishop) were created. By 627, there were 46 Buddhist temples, 816 Buddhist priests, and 569 Buddhist nuns in Japan. These schools were centered around the ancient capitals of Asuka and Nara, where great temples such as the Asuka-dera and Tōdai-ji were erected respectively. These were not exclusive schools, and temples were apt to have scholars versed in several of the schools. It has been suggested that they can best be thought of as "study groups". The Buddhism of these periods, known as the Asuka period and Nara period – was not a practical religion, being more the domain of learned priests whose official function was to pray for the peace and prosperity of the state and imperial house. This kind of Buddhism had little to offer to the illiterate and uneducated masses and led to the growth of "people’s priests" who were not ordained and had no formal Buddhist training. Their practice was a combination of Buddhist and Daoist elements and the incorporation of shamanistic features of indigenous practices. Some of these figures became immensely popular and were a source of criticism towards the sophisticated academic and bureaucratic Buddhism of the capital. The Late Nara period saw the introduction of Tangmi (Esoteric Buddhism, Japanese mikkyō) to Japan from China by Kūkai and Saichō, who founded Shingon Buddhism and the Tendai school, respectively. During the Heian period the capital was shifted from Nara to Kyoto. Monasteries became centers of powers, even establishing armies of Sōhei, warrior-monks. Shinto and Buddhism became the dominant religions, maintaining a balance until the Meiji-restoration. The Kamakura period was a period of crisis in which the control of the country moved from the imperial aristocracy to the samurai. In 1185 the Kamakura shogunate was established at Kamakura. This period saw the introduction of the two schools that had perhaps the greatest impact on the country: the schools of Pure Land Buddhism, promulgated by evangelists such as Genshin and articulated by monks such as Hōnen, which emphasize salvation through faith in Amitābha and remain the largest Buddhist sect in Japan (and throughout Asia); and Zen, promulgated by monks such as Eisai and Dōgen, which emphasize liberation through the insight of meditation, which were equally rapidly adopted by the upper classes and had a profound impact on the culture of Japan. Additionally, it was during the Kamakura period that the influential monk Nichiren began teaching devotion to the Lotus Sutra. Eventually, his disciples formed their own school of Nichiren Buddhism, which includes various sects that have their own interpretations of Nichiren's teachings. Nichiren Buddhism established the foundation of Japanese Buddhism in the thirteenth century. The school is known for its sociopolitical activism and looks to reform society through faith. Kinkaku-ji, the Temple of the Golden Pavilion, Shōkoku-ji sect of the Rinzai school, located in Kyoto. It was built in Muromachi period. In the Muromachi period, Zen, particularly the Rinzai school, obtained the help of the Ashikaga shogunate and the Emperor of Japan, and accomplished considerable development. After the Sengoku period of war, Japan was re-united in the Azuchi–Momoyama period. This decreased the power of Buddhism, which had become a strong political and military force in Japan. Neo-Confucianism and Shinto gained influence at the expense of Buddhism, which came under strict state control. Japan closed itself off to the rest of the world. The only traders to be allowed were Dutchmen admitted to the island of Dejima. New doctrines and methods were not to be introduced, nor were new temples and schools. The only exception was the Ōbaku lineage, which was introduced in the 17th century during the Edo period by Ingen, a Chinese monk. Ingen had been a member of the Linji school, the Chinese equivalent of Rinzai, which had developed separately from the Japanese branch for hundreds of years. Thus, when Ingen journeyed to Japan following the fall of the Ming dynasty to the Manchu people, his teachings were seen as a separate school. The Ōbaku school was named after Mount Huangbo (Chinese: 黄檗山; pinyin: Huángbò shān; Japanese pronunciation: Ōbaku san), which had been Ingen's home in China. Also notable during the period was the publication of an exceptionally high quality reprint of the Ming-era Tripiṭaka by Tetsugen Doko, a renowned master of the Ōbaku school. With the Meiji Restoration in 1868, the new government adopted a strong anti-Buddhist attitude, and a movement to eradicate Buddhism and bring Shinto to ascendancy arose throughout the country due to the strong connections of Buddhism to the Shōguns. During the Meiji period (1868–1912), after a coup in 1868, Japan abandoned its feudal system and opened up to Western modernism. Shinto became the state religion. Within the Buddhist establishment the Western world was seen as a threat as well as a challenge to stand up to. Buddhist institutions had a simple choice: adapt or perish. Rinzai and Soto Zen chose to adapt, trying to modernize Zen in accord with Western insights, while simultaneously maintaining a Japanese identity. Other schools, and Buddhism in general, simply saw their influence wane. The edict of April 1872 ended the status of the Buddhist precepts as state law and allowed monks to marry and to eat meat. This "codification of a secularized lifestyle for the monk coupled with the revival of the emperor system and development of State Shinto were fundamental in desacralizing Buddhism and pushing it to the margins of society". Japanese identity was being articulated in Nihonjinron, the "Japanese uniqueness theory". A broad range of subjects was taken as typical of Japanese culture. D. T. Suzuki contributed to the Nihonjinron by taking Zen as the distinctive token of Asian spirituality, showing its unique character in the Japanese culture. Nichirenism was one particular expression of Japanese Buddhist nationalism. During World War II, almost all Buddhists temples strongly supported Japan's militarization. In contrast, a few individuals such as Ichikawa Haku, and Girō Seno’o were targeted, and the Soka Kyoiku Gakkai, a Nichiren lay believers' organization, was ultimately banned by military authorities. During the 1940s, "leaders of both Honmon Hokkeshu and Sokka Gakkai were imprisoned for their defiance of wartime government religious policy, which mandated display of reverence for state Shinto." Japan has seen a growth in post war movements of lay believers of Buddhism and a decline in traditional Buddhism in the 20th century, with roughly 100 Buddhist organizations disappearing every year. As of 2008 approximately 34% of the Japanese identify as "Buddhists" and the number has been growing since the 1980s, as Buddhists were 27% in 1984. Still, around 90% of Japanese funerals are conducted according to Buddhist rites. "In 1963 Tamamuro Taijo coined the term Funeral Buddhism that came to be used to describe traditional Buddhism in Japan as the religion engaged in funerary rites and removed from the spiritual needs of people". Contrary to the ritualistic practice of traditional Buddhism, a revived modern form of Nichiren Buddhism led by lay believers Soka Gakkai "...grew rapidly in the chaos of post war Japan from about 3000 members in 1951 to over 8 million members" in 2000, and has established schools, colleges and a university, as well as cultural institutions. A study about the reason for the growth in lay believers and increased engagement in society attributes the cause to Nichiren teachings of 'social responsibility': "In the tradition of Nichiren Buddhism, however, we find the Lotus Sutra linked to a view of social responsibility that is distinctive". According to an academic study, lay believers of Buddhism "...offer an alternative view of Japan where their form of Buddhism would form the religious foundation of a peaceful and psychologically and materially enriched society". ["East Asian Buddhism is very diverse in its teachings and monastic practices, and Japanese Buddhism, in particular, represents almost every strand of Buddhist teachings and practices. However, in comparison to Chinese or Korean Buddhist schools that are generally more united and less sectarian in their groupings, Buddhist denominations in Japan have developed into independent sects with autonomous organizations that have differing emphases on the doctrine and separate lay followings." (Authors: Kawananami, Partridg, and Woodhead page 82. )]In the post-Meiji, pre-WWII period, there were officially 13 schools and 56 branches (十三宗五十六派 [ja]) of traditional Buddhism (i.e., those not established in modern times). 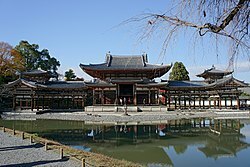 The official schools included three from the Nara period, two from the Heian period (Tendai and Shingon), four Pure Land schools, three Zen schools (Rinzai, Sōtō and Ōbaku), and Nichiren. During the war, this was halved to 28 branches, but the law enforcing this was repealed following the end of the war, allowing former branches to return. Further, since then, many groups have split off from existing branches. 625: Introduced into Japan. The Tattvasiddhi school (成實宗, Jōjitsu-shū) (formerly known as the *Sātyasiddhi) is considered to be an offshoot of the Bahuśrutīya, an Indian Sautrāntika school of Nikaya Buddhism; however, the Tattvasiddhi's position was also close to that of the Sthavira nikāya. They were distinguished by a rejection of abhidharma as not being the words of the Buddha. It was introduced to Japan as Jōjitsu in 625 by the monk Ekwan of Goryeo. In Japan, it was classified as one of the three approaches of East Asian Mādhyamaka instead of a separate lineage. East Asian Mādhyamaka (三論宗, Sanron-shū) was one of the six Nara sects (南都六宗, Nanto Rokushū). Temple tiles from the Nara period, 7th century, Tokyo National Museum. 654: Dōshō introduces East Asian Yogācāra (法相宗, Hossō). Yogācāra is based on an early Indian philosophy by masters such as Vasubandhu. Practices of this lineage are also known as "consciousness-only" since they teach that all phenomena are phenomena of the mind. The East Asian Yogācāra school of Buddhism was founded by Xuanzang (玄奘, Jp. Genjō) in China c. 630 and introduced to Japan in 654 by Dōshō, who had travelled to China to study under him. The Discourse on the Theory of Consciousness-Only (成唯識論, Jōyuishiki-ron) is an important text for the Hossō school. This school was transmitted to Japan in the 7th century. Literally: Three-Discourse School; a Madhyamaka school which developed in China based on two discourses by Nagarjuna and one by Aryadeva. Madhyamaka is one of the two most important Mahayana philosophies, and reemphasizes the original Buddhist teachings that phenomena are neither truly existent or absolutely non-existent, but are characterized by impermanence and insubstantiality. 736: Bodhisena introduces the Kegon (Huayan or Avataṃsaka) school to Japan. The Kegon school was founded by Dushun (杜順, Dojun) c. 600 and was introduced to Japan by the Indian monk Bodhisena in 736. The Avatamsaka Sutra (Kegon-kyō 華厳経) is the central text for the Kegon school. The Shin'yaku Kegonkyō Ongi Shiki is an early Japanese annotation of this sūtra. The Kusha-shū (倶舎宗) was one of the six schools of Buddhism introduced to Japan during the Asuka and Nara periods. Along with the Tattvasiddhi school (Jōjitsu-shū) and the Risshū, it is a school of Nikaya Buddhism, which is sometimes derisively known to Mahayana Buddhism as "the Hinayana". A Sarvastivada school, Kusha-shū focussed on abhidharma analysis based on the "Commentary on the Abhidharmakośabhaṣya" (倶舎論) by the fourth-century Gandharan philosopher Vasubandhu. The school takes its name from that authoritative text. 816: Kūkai founds Shingon Buddhism (真言宗, Shingon-shū). One of the major schools of Buddhism in Japan today and one of the few surviving Vajrayana lineages in East Asia, it originally spread from India to China through traveling monks such as Vajrabodhi and Amoghavajra. Known in Chinese as the Tangmi, these esoteric teachings would flourish in Japan under the auspices of a Buddhist monk named Kūkai (空海), who traveled to Tang China in 804 as part of the same expedition as Saichō. In the capital he studied Tangmi and Sanskrit and received initiation from Huiguo. On returning to Japan, Kūkai eventually managed to establish Shingon as a school in its own right. Kūkai received two lineages of teaching—one based on the Mahavairocana Tantra (大日経, Dainichikyō) and the other based on the Vajrasekhara Sutra (金剛頂経, Kongōchōkyō). The word "Shingon" is the Japanese pronunciation of Zhēnyán "True Words", which in turn is the Chinese translation of the Sanskrit word "mantra". 1175: Hōnen introduces Pure Land Buddhism to Japan. Chion-in, the highest temple of Jōdo-shū. Japanese name: 浄土, "Pure Land"
Japanese name: 浄土真, "True Pure Land"
Japanese name: 時宗 or 時衆, "Time"
Several variants of Zen's practice and experiential wisdom (禅宗) were separately brought to Japan. Note that Zen influences are identifiable earlier in Japanese Buddhism, esp. cross-fertilization with Hosso and Kegon, but the independent schools were formed quite late. Eihei-ji, the highest temple of Sōtō. 1654: Ingen introduces the Ōbaku (Huangbo) school to Japan. 1253: Nichiren (日蓮: "Sun-Lotus") expounds his teachings. Nichiren Buddhism split into several denominations after the death of Nichiren in 1282. The Nichiren Fuju-fuse-ha sub-sect of Nichiren Buddhism was abolished in 1669 and legalised again in 1876. Today's Nichiren Buddhism is represented by traditional-oriented schools such as Honmon Butsuryū-shū, Nichiren-shū and Nichiren Shōshū and more recent movements like the Soka Gakkai, Risshō Kōsei Kai, Reiyūkai and Nipponzan-Myōhōji-Daisanga. See Nichiren Buddhism for a more complete list. Primary Texts: Lotus Sutra (妙法蓮華經: Myōhō Renge Kyō; abbrev. 法華經: Hokke-kyō), treatises and letters by Nichiren. Japanese culture maintained an uneasy relation to Buddhist culture. While the Chinese culture was admired, Buddhism was also regarded as a strange influence. During the Kamakura (1185–1333) and Muromachi (1336–1573) Buddhism, or the Buddhist institutions, had a great influence on Japanese society. Buddhist institutions were used by the shogunate to control the country. During the Edo (1600–1868) this power was constricted, to be followed by persecutions at the beginning of the Meiji-restoration (1868–1912). 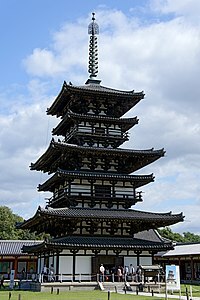 Buddhist temples played a major administrative role during the Edo period, through the Danka or terauke system. In this, Japanese citizens were required to register at their local Buddhist temples and obtain a certification (terauke), which became necessary to function in society. At first, this system was put into place to suppress Christianity, but over time it took on the larger role of census and population control. Iconographical evolution of the Wind God. Left: Greek wind god from Hadda, Afghanistan, second century. Middle: wind god from Kizil Caves, Tarim Basin, 7th century. Right: Japanese wind god Fūjin, 17th century. In Japan, Buddhist art started to develop as the country converted to Buddhism in 548. Some tiles from the Asuka period (shown above), the first period following the conversion of the country to Buddhism, display a strikingly classical style, with ample Hellenistic dress and realistically rendered body shape characteristic of Greco-Buddhist art. 2) Heracles on coin of Greco-Bactrian king Demetrius I. 3) Vajrapani, the protector of the Buddha, depicted as Heracles in the Greco-Buddhist art of Gandhara. 4) Shukongōshin, manifestation of Vajrapani, as protector deity of Buddhist temples in Japan. Various other Greco-Buddhist artistic influences can be found in the Japanese Buddhist pantheon, the most striking being that of the Japanese wind god Fūjin. In consistency with Greek iconography for the wind god Boreas, the Japanese wind god holds above his head with his two hands a draping or "wind bag" in the same general attitude. [c] The abundance of hair has been kept in the Japanese rendering, as well as exaggerated facial features. Vine and grape scrolls from Nara, 7th century. Soga no Umako built Hōkō-ji, the first temple in Japan, between 588 to 596. It was later renamed as Asuka-dera for Asuka, the name of the capital where it was located. Unlike early Shinto shrines, early Buddhist temples were highly ornamental and strictly symmetrical. The early Heian period (9th–10th century) saw an evolution of style based on the mikkyō sects Tendai and Shingon Buddhism. The Daibutsuyō style and the Zenshūyō style emerged in the late 12th or early 13th century. Although its date and practices vary region to region, the Bon Festival is celebrated primarily in Japan and in communities with large Japanese diaspora communities. It is believed that the spirits of the dead return to earth for three days and visit the family shrines or graves. It is customary to clean the graves and to hold family reunions. ^ In the original Chinese: "扶桑在大漢國東二萬餘里,地在中國之東(...)其俗舊無佛法,宋大明二年,罽賓國嘗有比丘五人游行至其國,流通佛法,經像,教令出家,風 俗遂改"
^ The transmission of the floral scroll pattern from West to East is presented in the regular exhibition of Ancient Japanese Art, at the Tokyo National Museum. ^ Bowring, Richard John (2005). The religious traditions of Japan, 500–1600. Cambridge, UK: Cambridge University Press. pp. 16–17. ISBN 0-521-85119-X. ^ Bowring, Richard John (2005). The religious traditions of Japan, 500–1600. Cambridge, UK: Cambridge University Press. pp. 15–17. ISBN 0-521-85119-X. ^ a b Dykstra, Yoshiko Kurata; De Bary, William Theodore (2001). Sources of Japanese tradition. New York: Columbia University Press. p. 100. ISBN 0-231-12138-5. ^ Hoffman, Michael, "Buddhism's arrival, Shinto's endurance", Japan Times, March 14, 2010, p. 7. ^ Leland, Charles G. (2009). Fusang Or the Discovery of America by Chinese Buddhist Priests in the Fifth Century. iblioBazaar, LLC. ISBN 978-1-110-85078-5. ^ Aston, W. G. (2008). Nihongi: Chronicles of Japan from the Earliest Times. New York: Cosimo, Inc. ISBN 978-1-60520-146-7. ^ Powers, John (2000). "Japanese Buddhism". A Concise Encyclopedia of Buddhism. 1. Oxford: Oneworld Publications. pp. 103–107. ^ a b Snelling 187, p. 178. ^ Snelling 1987, p. 181. ^ a b Snelling 1987. ^ Jaffe, Richard (1998). "Meiji Religious Policy, Soto Zen and the Clerical Marriage Problem". Japanese Journal of Religious Studies. 24 (1–2): 46. Archived from the original on November 19, 2014. ^ Victoria, Brian Daizen (2006), Zen at war (Second ed. ), Lanham e.a. : Rowman & Littlefield Publishers, Inc.
^ Onishi, Norimitsu. "In Japan, Buddhism May Be Dying Out". The New York Times. Retrieved 26 October 2013. ^ Ministry of Internal Affairs and Communications (2013). Japan Statistical Yearbook 2014 (in Japanese). Tōkyō: Nihon Tōkei Kyōkai. ^ "A Sect's Political Rise Creates Uneasiness in Japan". kenyon.edu. ^ "SOKA UNIVERSITY - Discover your potential 自分力の発見". soka.ac.jp. ^ a b Lopez 2013, p. 547. ^ Takakusu 2002, p. 76. ^ a b Lopez 2013, p. 574. ^ Woodhead, Linda; Partridge, Christopher; Kawanami, Hiroko, eds. (2016). Religion in the Modern World. Routledge Taylor and Francis Group. p. 82. ^ Kiyota, Minoru (1987). "Shingon Mikkyō's Twofold Maṇḍala: Paradoxes and Integration". Journal of the International Association of Buddhist Studies. 10 (1): 91–92. Archived from the original on January 25, 2014. Buswell, Robert; Lopez, Donald S. (2013). The Princeton Dictionary of Buddhism. Princeton University Press. ISBN 978-0-691-15786-3. Rahder, Johannes. "Harivarman's Satyasiddhi-sastra". Philosophy East & West, V. 5 (January, 1956) p. 348. Shi, Zhangqing (2004). The Two Truths in Chinese Buddhism. Motilal Banarsidass. ISBN 978-81-208-2035-7. Takakusu, Junjirō (2002). The Essentials of Buddhist Philosophy. Motilal Banarsidass. ISBN 978-81-208-1592-6. Victoria, Brian Daizen (2006), Zen at war (Second ed. ), Lanham e.a. : Rowman & Littlefield Publishers, Inc.
Asakawa, K., and Henry Cabot Lodge (Ed.). Japan From the Japanese Government History. Eliot, Sir Charles. Japanese Buddhism. London: Kegan Paul International, 2005. ISBN 0-7103-0967-8. Reprint of the 1935 original edition. This page was last edited on 1 April 2019, at 18:12 (UTC).